Yesterday’s discoverers are forgotten, faded to oblivion, erased from their maps. As I ask the students, do you know Rolf Blomberg’s books? They stare bufoed, but that’s not an imitation of the gaze of the giant toad discovered by Rolf Blomberg, Bufo blombergi. It is the gaze of the blankness of mind. Too much information around, and too much gets lost. How small our world is, that of travelling biologists and likes, traversing the world in pursuit of dreamed discoveries of new exciting animals or plants, new lands full of things to know and name. It has come to almost nothing and all the thorny paths of the past are paved. Why remember that transatlantic flights were unthinkable just two generations past. Rolf Blomberg was born into a family residing in Stocksund, just a short bike-ride from the Swedish Museum of Natural History. It was in 1912, 11 November, in times of relative peace and a relatively orderly Swedish society . The new building of the Museum, at the northern end of the experimental field, was up and running, although not complete until 1916, and young Blomberg became a frequent visitor. Crowding up with loads of stuffed skins, dried bones and spirited fish, however, wasn’t on the agenda for the future. Only 17 he took a job as ship hand, and only 22 he was on his life’s endless journey landing him first in the Galápagos, and eventually taking him around the world in the quest for the undiscovered, for the great adventure, in a time when everything was already discovered. Although familiar with Africa and Asia, he always returned to the rain forests of the Amazon and the trails of the treasure maps. Blomberg eventually settled in Quito, Ecuador, to become an old man never ceasing to dream of another adventure or the gold of El Dorado. He died in 1996 in Quito. Elderly Swedes, less and less of them, will mostly remember him for his jungle books and films, spiced with exoticism and anacondas, but yet important documentaries from now lost worlds. Others for his engagement in human rights, born out of his observations of the miserable social conditions and political alienation in which he encountered ethnic groups during his travels, particularly in the Amazon, but also extended to protesting the Viet Nam war in the 1960s. In Ecuador his name lives on. There is a good website at Archivo Blomberg with many of his photographs. The English Wikipedia has basic information, also carried by the German, but the Swedish almost zero. But, after all, he is not quite overboard in Sweden either: Not a little dose of nostalgia and substantial admiration for the explorer was manifested recently in a comprehensive biography by journalist Walter Repo (Repo, 2011), who also keeps a blog featuring blombergiana of all sorts, rolfblomberg.se. In Swedish. Let’s hope the book gets translated for the rest of the world. Galápagos giant tortoise Chelonoides nigra, collected by Rolf Blomberg (NRM 21169). Photo Sven Kullander, CC-BY-NC. Blomberg collaborated with several museums and systematists. 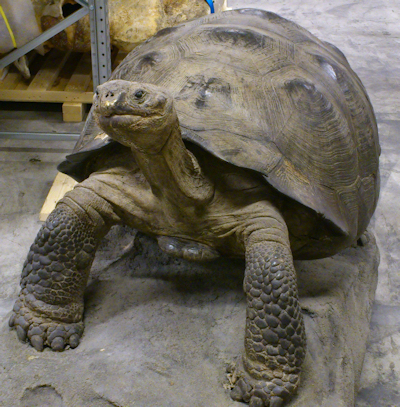 The museums in Gothenburg and Stockholm possess numerous specimens preserved in ethanol, and particularly noteworthy there are some outstanding mounted specimens of Galápagos tortoises and iguanas. His collecting resulted in four species being named after him. The most spectacular must have been the giant frog Bufo blombergi Myers & Funkhouser, 1951, now often seen as Rhaebo blombergi. Phyllomedusa blombergi Funkhouser, 1957, is a synonym of Phyllomedusa vaillantii Boulenger, 1882, a handsome little tree frog, dubbed white lined leaf frog in spaced English. Bulimulus blombergi Odhner, 1951, now Naesiotus blombergi, is one of so many land snails in Ecuador. Most colourful may be Boa annulata blombergi Rendahl & Vestergren, 1941, now Corallus annulatus or – for us who shun trinomina – Corallus blombergi, which despite its associative name is not a coral snake but a small non-venomous boid snake. Now, 100 years after Rolf Blomberg was born, it seems pertinent to add another name to the list, because he also collected fish and the fish collections distributed in the museums of Gothenburg and Stockholm have rested magically untouched for much too long. The species Andinoacara blombergi Wijkmark, Kullander & Barriga (2012), is a handsome fish which is known for sure only from the Esmeraldas drainage, the river of emeralds, on the Pacific versant of Ecuador. Some old specimens collected by Manuel Olalla are labeled with a locality in the more northern río Santiago, where it has not been found again, and some that Blomberg got from Ramón Olalla have the locality río Pucayacu, in Amazonian Ecuador. The latter locality is most certainly in error. Mistakes happen. Specimens collected by Blomberg in the río Blanco, one of the main sources of the Esmeraldas, are, however, included in the type series. Andinoacara blombergi, the holotype, MEPN 11180. Photo by Nicklas Wijkmark, CC-BY-NC. Andinoacara blombergi is very similar to A. rivulata, and has been confused with it for all of the existence of the latter, but it is more slim and with higher meristics. Andinoacara rivulata is a common species in the Guayas and Túmbes drainages in southern Ecuador and adjacent Peru. Everything taxonomic about Andinoacara blombergi is available by open access, so it might be a better idea to read there than to search for the same information here. The description of A. blombergi is based on the work of Nicklas Wijkmark as a Masters student under my supervision, presented in 2007. Seven years ago. Things take time. Nicklas actually made a revision of the whole genus Andinoacara, and more papers are in the tow. Nicklas has since attended to other career opportunities. One of his talents is photography, in which he excels in images of life in wild waters, close-ups of little things, and panoramas of the open landscape. Just sit down with a cup of something and cklick slowly through the marvellous photos at Wijkmark Photography. Wijkmark, N., S. O. Kullander & R. Barriga S. 2012. Andinoacara blombergi, a new species from the río Esmeraldas basin in Ecuador and a review of A. rivulatus (Teleostei: Cichlidae). Ichthyological Exploration of Freshwaters, 23: 117-137. Open Access PDF from Verlag Dr. Friedrich Pfeil. Posted in Aquarium fish, Books, Cichlids, Fish, Ichthyology, taxonomy and tagged Andinoacara, books, cichlids, collectors, Ecuador, Rolf Blomberg, South America, tortoise on 27 November 2012 by Sven Kullander.